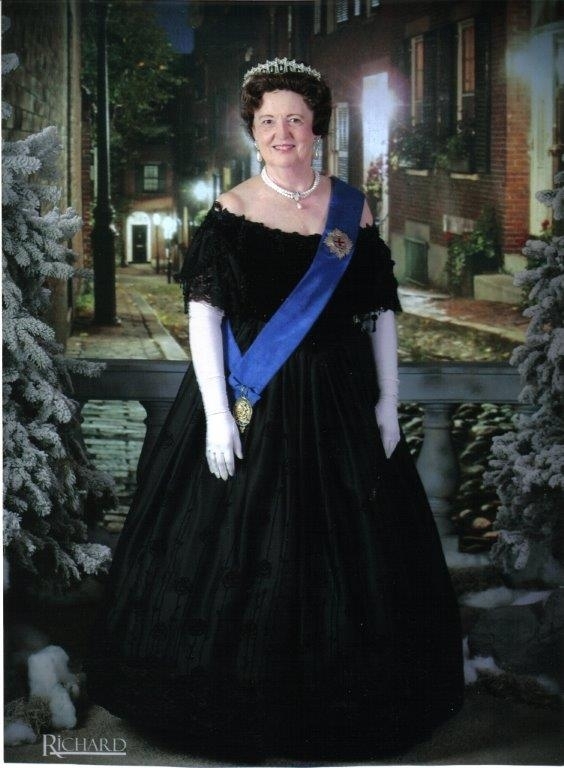 Queen Victoria, portrayed by Anne Boyd, visits Cambridge, Ohio. Imagine, if you will, stepping back to the time when Queen Victoria ruled Great Britain from 1837-1901. She had the longest reign of any British monarch in history – 64 years! During that time author, Charles Dickens, wrote his famous “A Christmas Carol”. Thus, Cambridge, Ohio, the home of Dickens Victorian Village, was the perfect place for their paths to cross again in modern times. Queen Victoria, portrayed by Anne Boyd, visited Dickens Victorian Village in Cambridge for a weekend of fun. Anne Boyd enjoys playing the role of Queen in various places – from Victoria, British Columbia to Dickens on the Strand in Galveston, Texas. Her visit in Cambridge began on Friday morning when the Queen, riding in a horse-drawn carriage, visited the local schools. Children gathered along the walks, bowing and curtsying to Her Majesty. 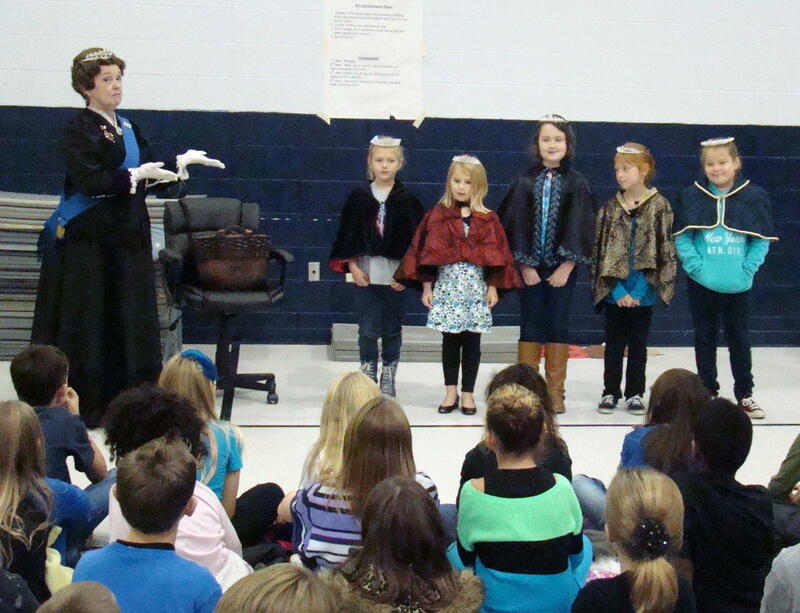 At Central School, Queen Victoria presents students dressed as her five daughters. Since the royal couple had nine children – five girls and four boys – five young ladies were chosen to portray her daughters. Each of the girls looked lovely in the cape and tiara she was given to wear. They all seemed quite pleased to be part of the festivities. Queen Victoria told the students how she and her husband, Albert, started the Christmas tree tradition throughout Great Britain. The Queen’s Christmas tree in Windsor Palace was featured in The Illustrated London News in 1848. Candles lit the tree while a bucket of sand and another of water were always placed close by…just in case of fire. They hand-made all of the ornaments: cornucopias filled with candy or nuts, and beautiful glass balls studded with jewels. A Bagpipe Band announces the Queen. Cambridge Social Dance Club presented Victorian dances in beautiful Victorian dress. One of the highlights of the weekend was the Queen’s Parade. 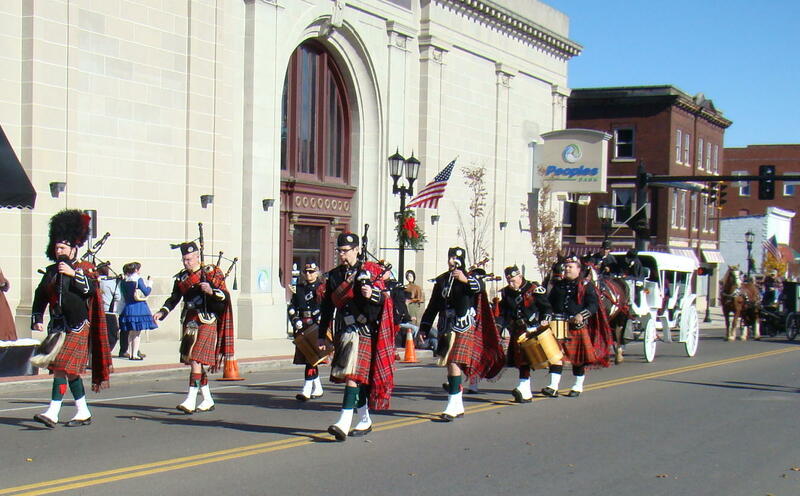 There were no motorized vehicles permitted so it was a quiet time, except for the wonderful bagpippers. Men on stilts and large wheeled bicycles added to the fun of the day. The Cambridge Social Dance Club performed traditional Victorian dances. Knighting Ceremony with Katy Billings, lady-in-waiting; Eugene Kyle, town crier; Queen Victoria; and volunteer of the year, Lindy Thaxton, who was knighted. 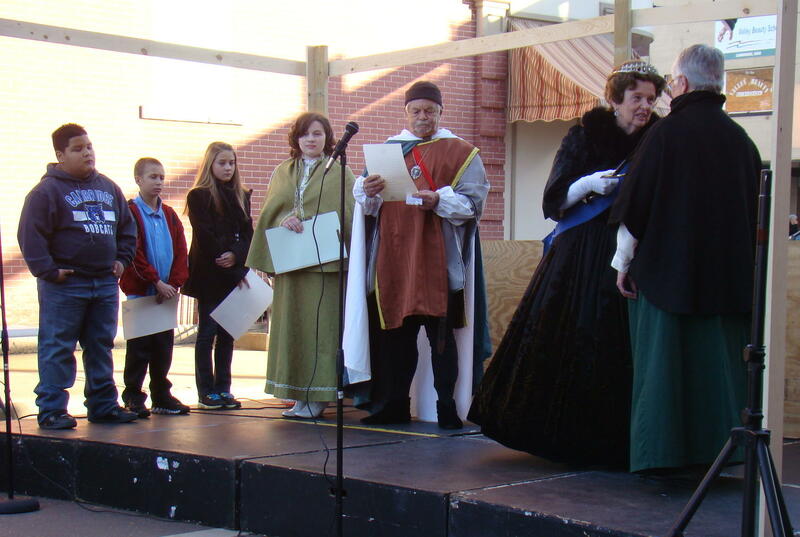 A knighting ceremony by the Queen involved several local students as well as Lindy Thaxton, the Dickens volunteer-of-the-year. Eugene Kyle, dressed in the proper flowing robe of the town crier, read the proclamations with flourish. When the Queen was handed the sword for knighting, she also whispered some words of encouragement to the individual. Her lady-in-waiting portrayed by Katy Billings was always at her side tending to her every wish. She helped the Queen by handing her capes, tiaras and swords, attended every event with the Queen, and learned patience while having lots of fun. The Queen enjoyed the many activities of the weekend, which included: a High Tea with the Queen, GeoCaching with Dickens, Tavern Tasting, Mingle with the Monarch at the Cambridge Glass Museum, and a “Gone But Not Forgotten” Victorian Funeral Program. Queen Victoria enjoyed the small town atmosphere and hopes to return another year. She was a very pleasant lady, who accepted every person as if they were an important part of her kingdom. When at home with her family, Anne has a reputation for making the world’s best chocolate chip cookies. Anyway you look at it, she was a very sweet lady. 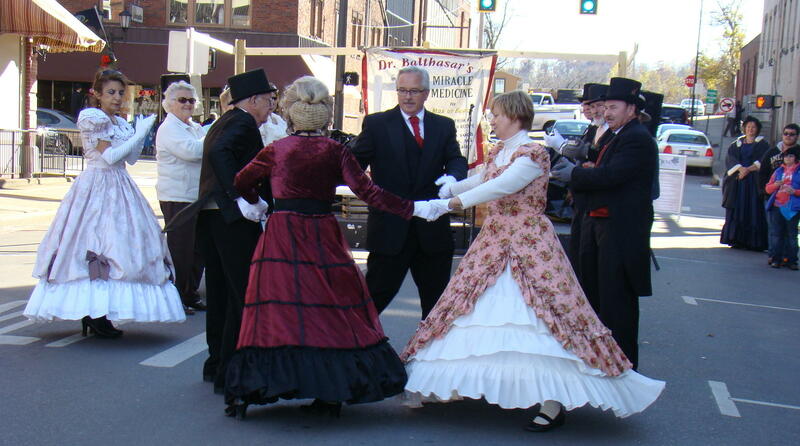 The Queen’s Weekend was one of several special weekends at Dickens Victorian Village in 2013. The Village is open through out November and December in downtown Cambridge, Ohio with many activities for the entire family. Cambridge, Ohio is at the crossroads of I-70 and I-77 so can easily be located.